Plant based compounds - The good, the bad and the ugly. Plants contain many different naturally occurring nutrients and chemical compounds. Some of these nutrients are sourced from the ground (minerals and trace elements) and are absolutely essential to the plants health, and growth. Other nutrients such as sugars, fats, proteins, vitamins and enzymes are produced within the plant’s internal bio-laboratory. These are not the only chemical compounds that plants produce. Plants also produce a range of defensive chemical compounds commonly referred to as Anti-Nutrients and even plant toxins such as cyanide. It is estimated that the plant world produces some 200,000 different chemicals. You have no doubt heard about the many beneficial phytochemicals found in richly colored fruits and vegetables. These compounds are lauded for their health benefits and antioxidant properties. Not commonly discuused, however are the many different plant based compounds that do not nourish. As a matter of fact they do the complete opposite with some being pure poison. The Limpopo Savannah incident may seem like an extreme example, but rest assured it is anything but. All living organisms are equipped with the tools required to ensure survival of their species. If plants did not have the means to defend against predation and even disease, they would not be the most successful and widely dispersed life form on Earth. On the contrary, the last plant would have been devoured, or succumbed to disease many millions of years ago. Is it possible that stressed and sick plants produce more anti-nutrients and plant toxins that are making us sicker? We know that the health and nutritional density of plants is dependent on a number of factors, among those soil fertility, location, water, and sunshine. Basically, plants that are grown in mineral rich soil with plenty of water and sunshine are “Happy” plants that produce better tasting, better quality, and more nutrient dense crops. They produce food that is better for us. But what happens when plants are grown under increasingly “stressful” conditions bought about as the result of drought, predation, or damaged soil that is deficient in the bio-essential macro and trace minerals, and rendered almost lifeless due to overuse and abuse? It’s very simple; plants become dysfunctional, sick, more prone to predatory attack, and are forced to divert finite energy reserves from producing macro “nutrients” that fuel us to producing defensive compounds that can harm us. The sicker, injured, or stressed the plant becomes, the more energy it will divert to producing defensive compounds. This is not a theory, but rather a cold hard fact supported by the very evolutionary blueprint of the plant world and more alarmingly, by more recent studies by renowned botanists and plant physiologists. Interesting research by Dr. Ros Gleadow of Monash University in Australia has shed more light on the pending threat to our food chain resulting from climatic change, in particular; how plants react to ever increasing levels of atmospheric carbon dioxide and it’s not all good news. Scientific theories that elevated atmospheric carbon dioxide levels, if nothing else will, at least bring about an agricultural boom were recently smashed when laboratory and field studies demonstrated the exact opposite. Dr. Gleadow looked at concentrations of cynaogens, (Cyanide) a natural defensive compound found in thousands of different plants, including many that are a source of food for us. Elevated carbon dioxide levels were found to lead plants to produce less in the way of nutrients that fuel us such as fats, sugars and proteins, and more in the way of defensive compounds such as cyanogens, other toxins, and anti-nutrients. What makes plant based food safe to eat, is the delicate balance of nutrients such as fats, protein, and sugars versus the phytochemical load. When plants are facing extraordinary stress due to drought or other natural phenomena, this fine balance is deliberately disrupted and valuable energy is diverted from the production of nutrients to the production of defensive chemicals. When we add undue injury, and stress by forcing crops to grow in “soils that are deficient in the bio-essential elements of the earth” (minerals and trace elements) and increasingly expose them to toxic agricultural chemicals, we are actually compounding this problem. When we genetically mutate them (GMO) we are entering completely unknown terrain, and the consequences could be dire! The last few decades have led to God-like leaps forward in biotechnology and agricultural science. The 1970’s showed great promise with the introduction of the first commercially available herbicide (glyphosate) that was effective and yet biodegradable as it was rapidly broken down by organisms living in soil. It was a popular labor saving weed management tool readily adopted by farmers in preparation for planting. 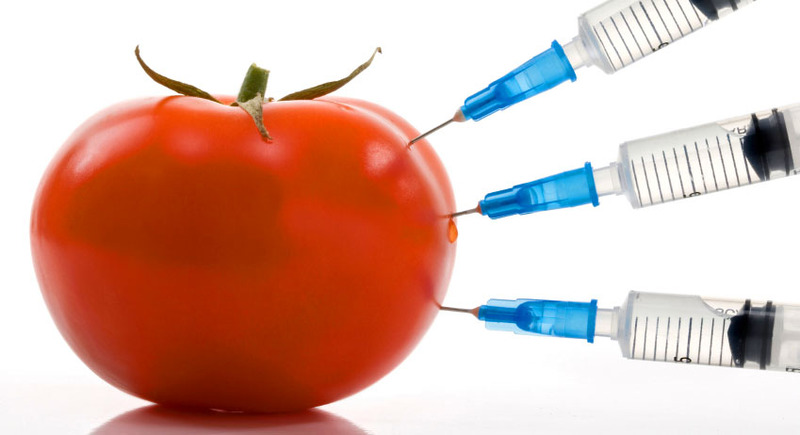 But it was the 90’s with the introduction of genetically modified seed (GMO) and the ability to freely apply glyphosate to immunized crops after planting that changed the terrain of farming forever. The sale of glyphosate smashed the global market, making the developers richer and more powerful than many small Nations. But it wasn’t long till cracks wide enough to swallow a harvesting combine started appearing and things are only getting worse! A survey conducted in 2012 by Stratus Agri-Marketing has revealed the extent of a problem that many farmers have known for quite some time - that the plant world has found the antidote to glyphosate. What is alarming is the pace at which plants, in this case “weeds”, are building a tolerance to glyphosate. 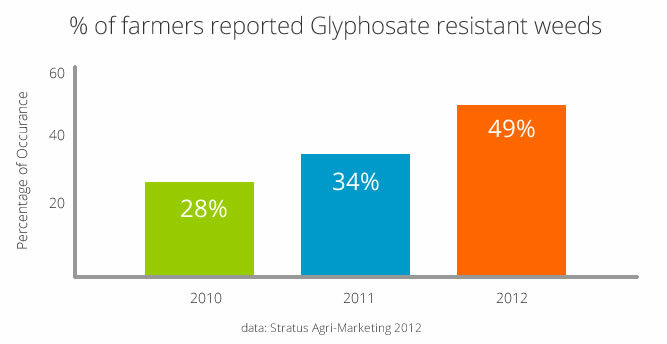 In 2010 28% of farmers reported glyphosate resistant weeds, in 2011 this figure rose to 34%, while in 2012 this figure jumped to 49%. In three short years we are looking at an approximate increase of 80%. This worrying trend has forced many farmers to revisit their weed management plans and include additional chemicals, which only adds to already high costs. This is bad for the farmer, bad for the environment and bad for the health of the crops. Have no illusions - what is bad for the crops, and the environment is bad for us too. The plant world’s ability to evolve and adapt to the most adverse conditions is due in no small part to its greatest weakness. Plants are not able to relocate to a more favorable location during periods of drought, nor can they flee predation by herbivores, be they insect, animal or man. However, what plants do have is an arsenal of chemical options that they use with ruthless efficiency. These include compounds known as Anti-Nutrients, which act by inhibiting nutrient absorption in predators, poisons which act as pesticides and even complex chemical compounds (gases) which they are able to use to communicate with other plants, warning of the presence of a foraging insect or animal in the vicinity. Cleverly, some plants use these complex compounds or gases to manipulate the insect world. When under attack from caterpillars, a number of different plants including corn and lima beans are able to release an irresistible chemical marker that attracts the caterpillar’s natural predator - the parasitic wasp, which will then proceed to destroy the foraging grub for the plant. How smart is that? The plant world’s ability to evolve and adapt to this new chemical world we have created is not in question. It can, and it will even thrive. What is of greater concern is can we keep up with the changing plant world and the mess we are creating? In part three we will be discussing the possible health implications of a changing plant world, and the many different plant compounds, – the good, the bad and the ugly. We will also look into age-old food preparation methods that help deactivate the bad, enhance the good, and ensure that you get the most out of your food. Part 3 of this article coming soon!!! Follow our Facebook page and you'll be notified when this article is available.